Estate planning consists of legal documents that set forth your personal wishes in the event of your incapacitation or death. Handling the issues of estate planning can be extremely difficult and emotional. However, ignoring these issues now can result in considerable financial and emotional anguish to your family in the event of your incapacitation or death. 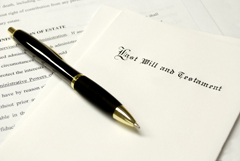 A Last Will and Testament is designed to provide for the conveyance of your personal property upon your death and is typically tailored to your own extremely personal desires as to the distribution of your property. A Living Will is often included with your estate planning documents if you have made the personal choice to exclude the use of life-sustaining procedures in the event you are in an irreversible state of illness. Also included in most estate planning documents are Property and Health Care Powers of Attorney. A Property Power of Attorney appoints an agent to act on your behalf to attend to your property and finances in the event you are incapacitated. The Health Care Power of Attorney allows your appointed agent to make your necessary health care decisions in the event you are unable to make them for yourself. Depending on your individual circumstances, a children’s trust may be necessary if your children are minors or a living trust may be necessary if you own real estate in order to allow an appointed trustee to make necessary transactions concerning this property. Estate taxes are also a big concern for many individuals as estate tax rates can be as high as 55%. Proper planning can minimize a great deal of anguish to your family in the unfortunate event of your death. Our firm is also there to look out for the best interests of your family in the event of your death. The probate process can be extremely difficult and time-consuming while your family is attempting to recover from the sadness of losing a loved one. Our attorneys can bear the majority of this burden for your family so that they can begin the healing process.